ELEPHAS 2017 Professional Movie Projector, Ideal for Office, Home Entertainment, Party, Games, a Great Gifts for Your Family and Friends! Specifications Native Resolution: 1280*800 Pixels, support to 1080P Display Technology: LCD Light Source: LED Lamp Life: 50000 Hours Projection Size: 33″-260″ Projection Distance: 1.2-8.5m Keystone Correction: ±20°(vertical) Aspect Ratio: 4:3/16:9 Number of Colors: 1.07 Billion HIFI Level Stereo: 4Ω,2W with SRS Sound Input: VGA/AV/audio*1, HDMI/USB*2 Voltage: 90-240V/50-60Hz Movie format support: MPG/AV/TS/MOV/MKV/DAT/MP4/VOB Audio format: MP3/WMA/AAC/M4A Picture format: JPG/JPEG/BMP/GIF/PNG/GIF formats picture browsing E-book read: TXT/ LRC etc Package included 1 × ELEPHAS Video Projector 1 × AC Power Cable 1 × Remote control 1 × Video Cable 1 × Projector lens cap 1 × User Manual 1 × HDMI Cable 1 × Cleaning cloth 2 × Foot AdjusterUltimate Visual Experience: ELEPHAS CL760 projector is equipped with a 3,500 luminous efficiency LED light and native 1280×800 pixels resolution screen. Super Color Technology and 2000:1 contrast ratio delivers superior picture color, you can adjust the picture size from 33″ ~ 180″ (Best for 130″, 2 – 2.5m). Built-in HD decoder chip supports 1080P video input, meets most of your using needs. 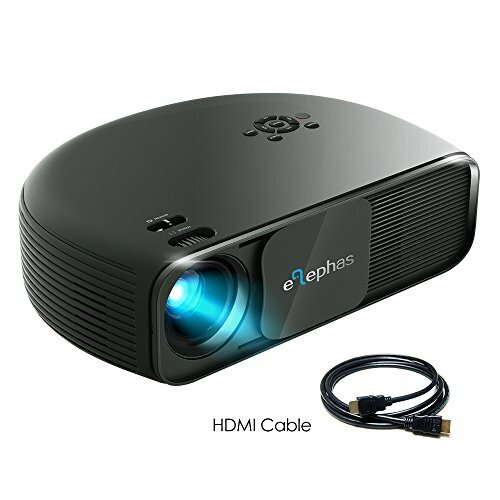 STRONG CONNECTION: Support HDMI/VGA/AV/USB, ELEPHAS CL760 Projector enables to connect to Amazon Fire TV Stick/ Roku Streaming Stick/ Laptop/ Blue-Ray DVD player/ PS3/ PS4/ Xbox/ TV box via HDMI input; Connect to PC via VGA jack; Hook up to headphone/ outer speakers via Audio port; Insert U-disk/ hard disk device into USB slot. Adapters are required if you connect the projector to a Ipad, Iphone or other tablets and smartphones. Can’t support Google Chromecast.